Balance bikes have a huge range of features, and one of the decisions to be made when choosing the best balance bike is the type of frame component. Your main choice will be to choose between a wooden frame and a metal frame, which will comprise of steel or aluminium. This guide is going to look into wooden balance bikes in some detail, the features and advantages of wooden balance bikes as well as some recommended models. ​The first advantage of wooden balance bikes is that they look great and kids love them. 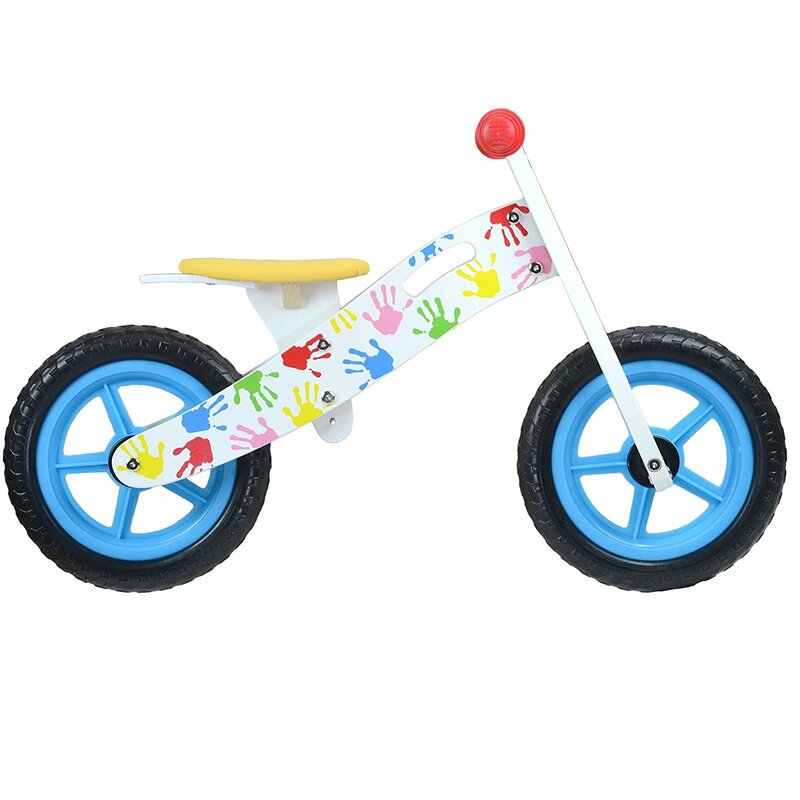 Wooden balance bikes can be painted in all colours and in funky, stylish and fun designs. Wooden balance bikes are also environmentally friendly with most bikes made from birch plywood. This material is favoured as the birch is very light but also very strong and durable, so this is essential for bikes that might see some heavy use over a couple of years. A third advantage of wooden balance bikes is that many of them have spoke less wheels so there is less chance of little fingers and toes getting trapped. They are also easy to manoeuvre and great fun! Although wooden balance bikes look great, they are not as close in appearance to a real bike. If your child would prefer a sleeker and sportier model then you may want to look for a steel or aluminium bike instead. Wooden balance bikes will also generally have a much smaller range of heights on the saddle so they are not as adjustable as metal balance bikes. This means that they may not last as long as your child may outgrow the bike if they have a growth spurt. Wooden balance bikes will also generally have a higher starting height for the saddle, so if you are looking for a balance bike for a 2 year old you might be better looking at our recommended models for this age group. Some might be concerned about a wooden balance bike warping, but this should not be a problem as long as you don't leave the bike out in the rain! 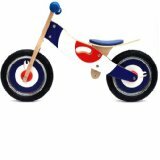 One of the leading manufacturers of wooden balance bikes are Kiddimoto, who offer a range of balance bikes for children from 2 to 6 years. Their bikes are made of natural birch plywood and are sourced from managed forests so you will be doing your bit for the environment if you choose one of their bikes. 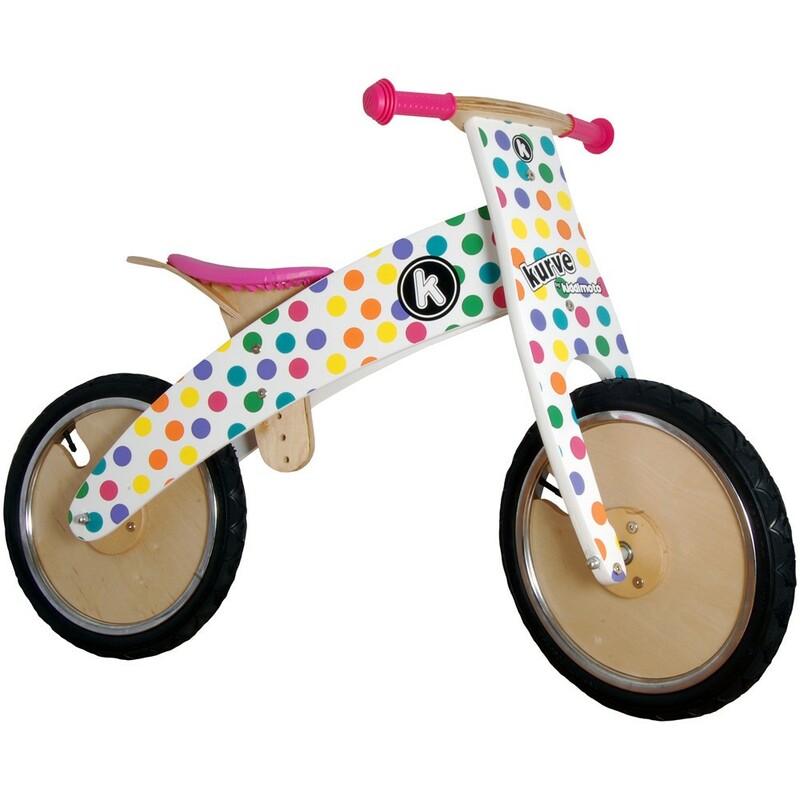 The most well known model from Kiddimoto is probably their Kiddimoto Kurve bike (pictured). This is available in a whole range of fun designs, including Pastel Dotty, Union Jack and Skullz. The Kiddimoto Kurve is recommended for children aged between 3 and 5 and is priced at around £75. Prince Lionheart is another brand of wooden balance bikes, and they are also made from birch plywood so they are light and strong. 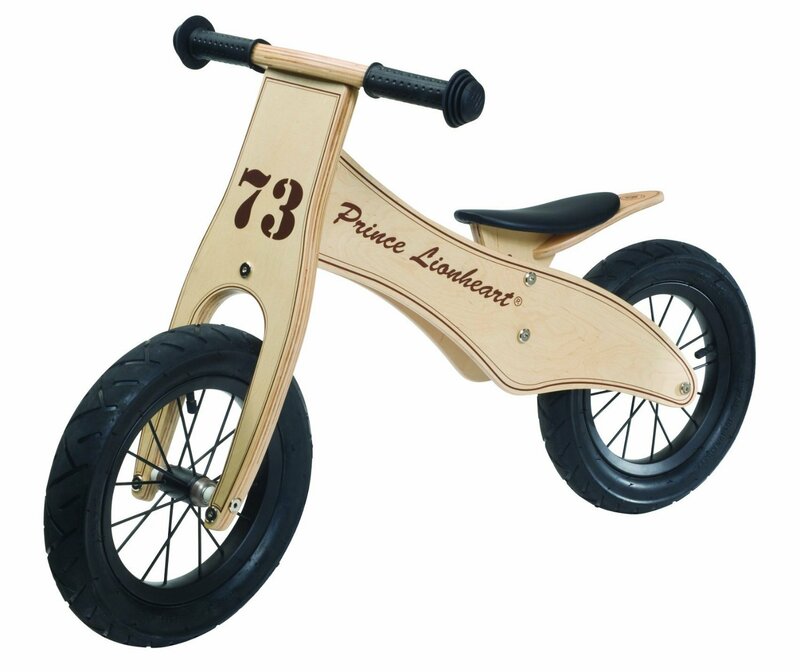 The Prince Lionheart balance bike has a stylish and sporty appearance, with comfortable rubber grip handlebars, the makers name across the side and the racing number 73 on the front of the bike. The bike is less expensive than the Kiddimoto Kurve and is generally available for between £50 and £60. If your budget for a wooden balance bike is less than £50, then a great option is the Jiggy Wooden Balance Bike. This bike has a great retro style, with a red, blue and white design running throughout including the handlebars. The birch plywood frame is lightweight, and the padded seat can be adjusted between 34cm and 38cm height. The soft plastic handlebars feature safety ends, and the wheels have inflatable tyres with a blue infill. This is a really popular bike that is available for just over £40, with an optional stand available for just £5 extra for easy storage. An alternative wooden balance bike costing less than £50 is the Boppi Wooden Balance Bike. This brightly coloured bike is really lightweight and will really stand out in the playground! The Boppi Wooden balance bike is the best value of all of the bikes we have mentioned here, and is available for around £30. The most important factor to consider when you are choosing the best balance bike is the fit for your child, but there are definitely pros and cons to buying a wooden balance bike. At the end of the day, it will come down to personal preference, the style and design as well as the frame. There is a great choice of bikes out there to suit everybody!